Since its introduction in 1999, the Eurozone has been perceived as one of the boldest socioeconomic experiments born out of a path-breaking economic idea. Economically unified via the construction of a single market for goods, services, and money, the Eurozone, however, remained politically divided as the governance of its members has remained under the authority of national polities. While the benefits of the Eurozone appear to be significant, its long lasting, viewed by some, existential crisis, remains a contentious topic in academic, business, and public discourse. This paper evaluates the prevailing narratives of the crisis as they are presented in the North American media. It assesses editorials and articles in four major newspapers (two American and two Canadian) in order to identify the similarities and differences in narratives presented in all four. Among other issues, the single market and the Euro created a power imbalance between European Union institutions such as the European Central Bank, market forces, and the political institutions of Eurozone members. The treatment of this imbalance by each of the four newspapers is of particular interest because such treatment defines who or what the North American media blames for the crisis and the solutions it suggests. The paper hopes to contribute to existing academic discourse in at least three ways. 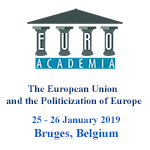 It can provide for a comparative analysis of Eurozone crisis narratives originating on both sides of the Atlantic and thus contribute to informing policy decision-making and Eurozone governance reforms. It can provide a better understanding of North American business attitudes toward the Eurozone and resulting foreign investment activity. It can also reveal ideological differences and the extent to which the media narratives of the crisis parallel those in academia.